relieving pressure in areas of the joint affected by arthritis and similar conditions. Karl Hager Limb & Brace (L&B), located in Edmonton, Alberta, works with patients every day to provide customized knee braces for anyone in need. Karl Hager L&B oversees the complete manufacture of the orthosis from start to finish. 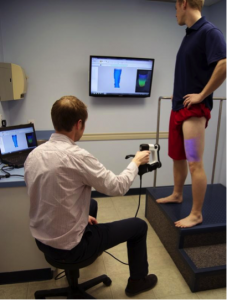 A general overview of one of the production processes starts with a digital scan or cast of a patient’s leg (Figure 1). Once a patient model is created, a foam CNC lathe or plaster method can recreate the leg’s identical shape. Then, thermoforming – a process which involves using a vacuum seal to form hot sheets of plastic to the desired shape – is used on the foam or plaster leg to contour the brace to the patient’s specific leg. To provide the joint of the knee brace (Figure 2), a special component is used in the thermoforming process. This component will be referred to as a “Knee T”. Its purpose is to hold the knee joint along the correct anatomical position when thermoforming the polycentric joint. While the highly talented team at Karl Hager produces knee orthoses at a quick rate to keep their patient’s mobile, there are a few parts that can slow down production. The Knee T is one tool that, up until recently, slowed down their production. Since the Knee T is often up against plaster legs, it requires frequent cleaning with a dremel which takes time. It also damages the Knee T to the eventual point of replacement (Figure 3). So, reducing the replacement time to keep production running smoothly is the real obstacle with this part. That is where 3D Print Western stepped in. There were three main concerns with using a 3D printed plastic Knee T mould rather than a metal one. The first concern was using thermoforming on the 3D printed plastic mould. Thermoforming at Karl Hager is done in an oven at 190°C, but the sheet plastic inside reaches ~110°C. The possibility of bonding between the sheet plastic and the 3D printed plastic could render the 3D printed mould useless if it could not be separated from the final product. The geometry of the Knee T is vital to the brace’s joint alignment in the finished product (Figure 4). Secondly, another concern was the strength of the 3D printed plastic in compression. Compared to the existing steel product, the strength is significantly less. However, the only forces the part undergoes is: two snug nut and bolts to secure the Knee T with an end plate and a high compressive strength is not required (Figure 5). The third concern was the importance of the maintaining a flat surface on the Knee T along the leg. If any hardware stuck out it would affect the alignment of the Knee T and thus the alignment of the finished product. Through 3D printing, the ability to have an on demand “digital inventory” that can be printed at any time significantly reduced the lead time of Knee Ts and offered an immediate solution. 3D Print Western proposed using ULTEM as the 3D printed material of choice. 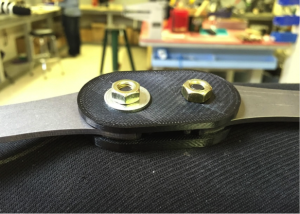 This was for multiple reasons: Firstly, ULTEM has the highest tensile and compressive strength of any FDM thermoplastic which made it the best choice to not crack under the tightened nut and bolt pressure. Secondly, ULTEM has a relatively high glass transition temperature (the point at which the solid plastic becomes soft and rubbery) of 186°C. 186°C is greater than the approximate 110°C temperature of the plastic thermoforming sheet, ensuring the 3D printed mould would maintain its solid geometry under the heat. To solve the problem of a maintaining a flat and level surface against the leg, new hardware was chosen to accommodate the application. A countersunk bolt provided a simple and effective solution for providing a flush surface (Figure 6). 3D Print Western (3DPW) worked closely with Karl Hager L&B through on-site visits to understand the critical features of the Knee T’s design that were paramount to its success. 3DPW’s engineering and design team reverse engineered the existing part. In doing so, they were able to eliminate internal components that were only required due to traditional manufacturing of the original parts. A simplified version of the component was able to be produced through the reverse engineering process. Less internal components mean a simplified inventory and space savings. 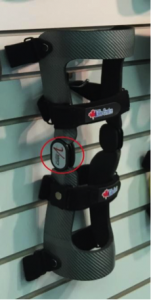 The previous manufacturer of the Knee T was able to offer a lead time of 30 days. Once the 3D printer is prepped for ULTEM and reaches its high operating temperatures, it takes only 52 minutes to print and approximately 30 minutes of post processing. Due to the locality of Karl Hager L&B, the part could be delivered within the day. That is over a 30x decrease in lead time thanks to 3D printing. 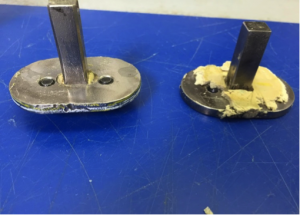 When the part becomes damaged and unusable, a new one can be reproduced at a significantly increased rate. 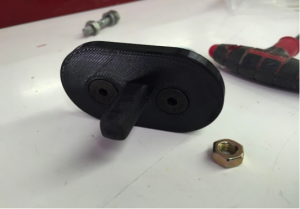 The initial prototype was produced and tested against the largest unknown: the adhesion between the thermoform plastic and the 3D printed thermoplastic. The advanced ULTEM thermoplastic stood up to the challenge. It showed no signs of warping or any difficulty in separating the thermoformed plastic, proving the part to be as simple to work with as the metal version. The countersunk slot on the Knee T provided a flat surface on the leg when hardware was installed and met the last critical requirement of the application. 3D printing is changing the ways custom manufacturers like Karl Hager Limb & Brace think about their inventory and simplifying their workflow. 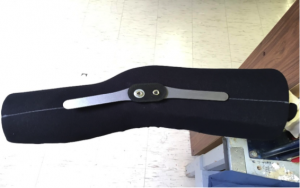 3D Print Western thanks Karl Hager L&B for the opportunity to work on such a wonderful project and are happy to provide solutions to bring knee orthoses to patients in need as quickly as possible.